Ervin Bamesberger, age 94, of Aurora, passed away on Wednesday, August 2, 2017, at Memorial Community Care in Aurora. Funeral Services will be held at 10:30 A.M., Saturday, August 5th at the Evangelical Covenant Church, 1009 1st Street, in Aurora. Rev. Karl Larson & Rev. Jim Garfield will officiate. Interment will be in the Aurora Cemetery. Visitation will be from 6 to 8 P.M. Friday at the Higby-McQuiston Mortuary. Memorials may be made to the Evangelical Covenant Church or Lester S. Harter Post #42 American Legion. Condolences may be e-mailed to the family through the mortuary website at www.higbymortuary.com. 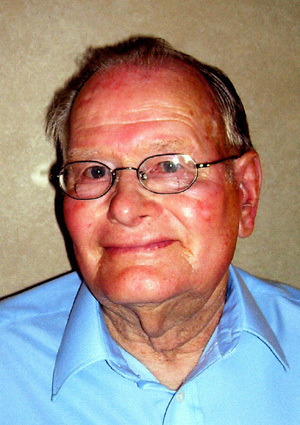 Ervin Bamesberger, the son of William Frederick and Ruby Agnes (Salmon) Bamesberger was born on July 30, 1923 at Aurora, Nebraska and passed away in Aurora, Nebraska on August 2, 2017, at the age of 94. Ervin grew up and attended school in Aurora. He graduated from Aurora High School in 1942. He entered the U.S. Army serving during WWII on January 6, 1943. Ervin was involved in the Invasion of Normandy in 1944 and was honorably discharged on October 29, 1945. Ervin returned to work with his father as a carpenter and contractor. His father furnished the pickup, tools and Ervin did all the planning & figuring to complete the jobs. His father passed away on his 35th birthday and at that time Erving took over the business. On September 4, 1949 Ervin was united in marriage to Evelyn Onken at the First Christian Church in Aurora. They had two children, David and Denese. In 1956, Ervin started at the U.S. Post Office delivering Christmas packages on a part-time basis still working his carpenter job full-time. He secured a full-time position at the post office when one became available and then worked his carpenter job part-time. Ervin delivered mail for 35 years, retiring in 1990. During this time he was co-owner with Evelyn of the Color Spot in Aurora for almost 10 years. He retired from carpentry work in 2000. Ervin was a member of the First Christian Church for 30 years, the Assembly of God Church for 40 years, where he was an active member in both. He became a member of the Evangelical Covenant Church in April 2017. Ervin was a very active and proud member of the American Legion. He served as commander two different times. Once when he was commander he and Evelyn went with another couple to the National Convention in Hawaii in 1973. In 2008, Ervin was on one of the first Honor Flight to Washington, D.C. and when he returned he told about his experience to almost every organization, the Aurora High School and even some churches. Everyone said they could tell how honored he was to be an American Veteran. Ervin enjoyed traveling and seeing his children and grandchildren. Ervin was onery. He most enjoyed his 90th birthday party his family gave for him. Over 300 people attended and he spoke to every one of them. He was preceded in death by his parents; two sisters, Marjorie Blasé and Wilma Smith; brother, Bill Bamesberger; in-laws, Russell & Florence Onken and brother-in-law, Bob Scott. Those left to cherish his memory include his wife of over 67 years, Evelyn; two children, David (Alyce) Bamesberger of Naples, Florida and Denese (Derwin) Callen of Livermore, California; two grandchildren, Lauren Bamesberger of Tampa, Florida and Drew Callen of Livermore, California; three sisters-in-law, Rachel Scott of Grand Island, Babe Bamesberger of Grand Island and DeEtta (Dallas) Amend of Fountain Hills, Arizona; brother-in-law, Lorence Blasé of North Platte and many nieces, nephews, and other relatives and friends.